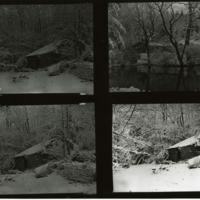 This black and white image is a scan of a contact sheet containing the four images between Pal-Bla-4-90 and Pal-Bla-4-93. 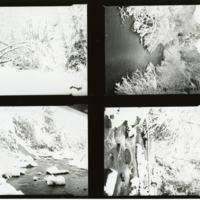 The four images feature the snow covered foliage surrounding a meandering stream in winter. This black and white image is a scan of a contact sheet containing the four images between Pal-Bla-4-94 and Pal-Bla-4-97. 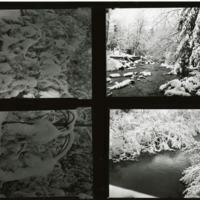 The four images feature various snow scenes, two of which focus on a meandering stream. This black and white image is a scan of a contact sheet containing the four images between Pal-Bla-4-98 and Pal-Bla-4-101. The images feature an old abandoned shed and snow scenes.